Jets backup Chris Mason turned down a two-year deal and signed in Nashville. For Jets fans on Twitter throughout Canada Day and, to a lesser extent depending who you are, Free Agent Frenzy, there was much to do about why the Jets were not signing players and, in essence, losing more players to other teams than signing more. In a day that saw a number of teams land bigger name free agents - Dallas landing Ray Whitney, Tampa landing Sami Salo, Colorado landing P.A. Parenteau, and Vancouver landing Jason Garrison - the Jets had a net loss of players, as forward Tanner Glass signed a two-year deal with Pittsburgh worth $1.1 mil per and backup goalie Chris Mason returning to the club who drafted him for one year worth $1.25 mil per. These two departures may be the biggest blow to any Jet fans ego because of the weight these guys held with the fans and with the team identity. 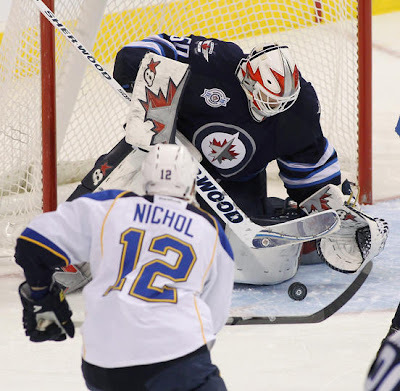 Mason, who was the first Jet to step onto the ice at the MTS Iceplex last summer along with ordering special order Jet goalie pads, blocker, and glove, appeared to be the most gung-ho and passionate about wanting to stay in Winnipeg, even as a backup to budding starter Ondrej Pavelec. But according to TSN's Sara Orlesky via Twitter, Jets General Manager Kevin Cheveldayoff offered Mason more term and more money, but Mason opted to move back to Nashville. Ken Wiebe, of the Winnipeg Sun, mentioned that Mason was torn between a two-year deal offered by the Jets and the Predators one-year deal. In all, fans may feel that Mason paid somewhat cheap lip service to Jet fans and media about his intentions and his passions. Luckily for Jets fans, he's just the backup goalie. Talks were beginning with New Jersey Devils backup Johan Hedberg, according to Orlesky via Twitter, but has somewhat stalled since. Other backup goalies Jets fans could potentially look forward to seeing in a Jets jerseys as UFAs include Marty Turco, Andrew Raycroft, Justin Pogge, and Al Montoya among other lesser known names. 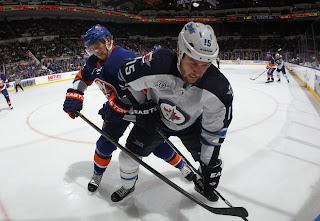 As for Tanner Glass, his departure leaves more to be desired to be replaced by the Jets. Fan favourite winger Tanner Glass is off to Pittsburgh. Glass, who ranked tenth in the NHL in hits with 246, will be hard to decently replace with anyone who can add grit after many tough guys were snatched up on July 1, including Brandon Prust, George Parros, Arron Asham, Brad Staubitz, and local boy Jordin Tootoo. Signing with Pittsburgh was the Penguins way of filling the hole left by Arron Asham. 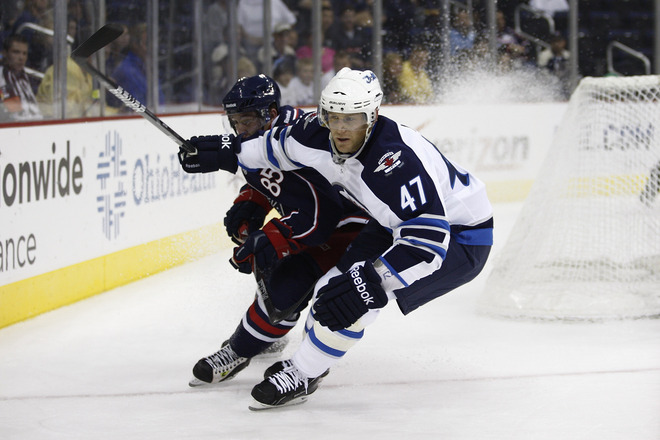 Now that Pittsburgh signed a Winnipeg fan favourite, the Jets will probably not search too hard as they may look to fill the gap left by Glass with an upcoming prospect in the likes of a Patrice Cormier. Filling the void left by Glass on the GST line may seem as either a big job or not significant at all depending on where value is placed on Glass' impact on the team. Surely, he was a prototypical Cheveldayoff guy - grit, heart, lunch pail work ethic - but can a Patrice Cormier fill that role at a younger age and cheaper contract? Jets inked Ponikarovsky to one year @ $1.8 mil per. The Jets did, however, dip into the free agency pool and sign Nikolai Antropov's former linemate Alexei Ponikarovsky to a one-year, cap friendly $1.8 million deal. Ponikarovsky reached his first Stanley Cup Final last season with the New Jersey Devils - his fifth team in five years - and had nine points in 24 playoff games. He had a disappointing start to the 2011-12 season after scoring only 15 points in 49 games with the Carolina Hurricanes fresh off a new, one-year contract. 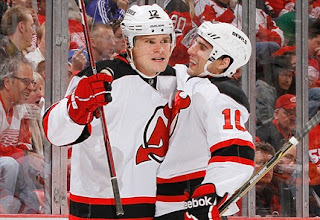 But after a trade to New Jersey, Ponikarovsky seemed to find a bit of a stride scoring 18 points in his final 33 games with the Devils. Ponikarovsky has played in 636 career games, collecting 314 points (135 goals, 179 assists) with the Toronto Maple Leafs, Pittsburgh Penguins, Los Angeles Kings, Hurricanes, and Devils. As he is reunited with Antropov, the immediate thought is how Ponikarovsky will add size and will possibly help his former linemate in Toronto to produce more. Antropov had 35 points (15 goals, 20 assists) in 69 games with the Jets last season, his lowest point total since 2006-07 with the Leafs. The Jets centre is only two years removed from a career year of 67 points in Atlanta, so the hope is Ponikarovsky can help Antropov. Along with the signing of Ponikarovsky, the Jets also re-upped Winnipeg native Derek Meech to a two-way deal and Jason King to an AHL deal. Meech, whose season was shortened due to injury, was an instrumental part of the St. John's Ice Caps blueline en route to their long Calder Cup Playoff run scoring nine points (four goals, five assists) in 15 playoff games. Jets re-signed local Winnipegger Meech to a two-way deal. During the regular season, Meech appeared in two games for the Jets (four penalty minutes, plus one) and six games for the Ice Caps (two assists) before succumbing to injury. A former Detroit Red Wings pick, Meech will look to prove himself again to the Jets that he can be a full time NHLer and has good shot at it too as the only local boy now on the team with the departure of Eric Fehr. In 128 career NHL games, the 5'11 defenseman has 16 points (four goals, 12 assists) and 43 penalty minutes. As for King, he had a good first season back in North America after playing three seasons in Germany. In 70 games for the Ice Caps, King registered 22 goals and 19 assists for 41 points alongside 34 penalty minutes and a minus 14 rating. Look for Cheveldayoff to take a measured approach to the remainder of the summer when sizing up his team. For the Jets brass, changing the identity is key as they will want to further distance themselves from being an organization that was built by another GM in Atlanta and becoming more and more ingrained as the Winnipeg Jets. Again, the Jets are doing things the Chevy way - thus patience is key.